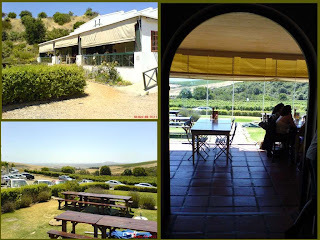 About a week ago we played hooky, call it our "staff Christmas outing", and visited the Hillcrest Restaurant on the Durbanville wine estate of the same name. The plan was to do some last minute shopping at the Tyger Valley Centre and then have a relaxing lunch before heading home. Hillcrest Estate is located on the Durbanville wine route, about 20km northeast of Cape Town. It sits high in the Tygerberg Hills with a panoramic views taking in large stretches of Table Bay with Robben Island clearly visible on a clear day. The vineyards stretch in an arc across the hills around the restaurant providing a lush foreground and a delightful country ambience. Hillcrest Restaurant is a popular lunch venue for Capetonians, particularly those living in the northern suburbs. It has a relaxed, informal character with a mix of Mediterranean and local styles. The small menu offers a selection of salads, meat and cheese platters, burgers, sandwiches, daily specials and a selection of deserts. The wine list is small and restricted to wines from the Hillcrest Estate. Seating is mostly outdoors on the veranda and grassed frontage with a few tables inside in the wine tasting area. We both selected the burgers, which are prepared from high quality ingredients on home made ciabatta and a far cry from those you get in a fast food joint. They were exceptionally good and both of us enjoyed a tasty lunch at a reasonable cost in a delightful atmosphere. Burgers are served with French fries but the restaurant is quite willing to substitute salad if you request it. We finished the meal with homemade ice cream with a dribble of chocolate sauce for Carol and cheesecake for myself. The chocolate sauce was rather sparse but Carol declared the ice cream delicious. The cheesecake was first class, fluffy and creamy with a rich cheesy flavour. The bill, including a beer and a bottle of the zesty Hillcrest unwooded Chardonnay came to R245,00.